Owning and operating an industrial site is not cheap. There’s expensive machinery, safety regulations, and production schedules to follow. Unexpected repairs can bring work to a halt, delaying projects and racking up a huge expense. Dornbrook Construction recommends the use of concrete flooring to keep costs down by minimizing floor maintenance. The overall costs of installing concrete flooring is lower than using other materials because concrete is poured into place. The process is faster than laying individual tile pieces or cutting and staining wood. Our Dornbrook contractors know trying to find an affordable flooring option based on square footage is difficult. Fortunately, our free online estimates will help you learn exactly how you can afford new concrete for your industrial facility. Costs will continue to go down thanks to the longevity of concrete. You won’t have to pay for expensive replacements or refurbishments every few years when you use concrete flooring. 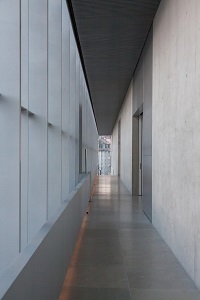 Concrete is easy to clean and maintain, reducing the chances of an accident at your workplace. Wood and linoleum can be damaged by equipment, leading to gouges in your flooring. These alternative flooring types will need to be replaced more often than concrete, which can last anywhere from 15 to 30 years depending on usage and traffic. Increase the lifespan of your flooring and machinery with specially installed concrete machine base foundations from Dornbrook Construction. This reinforced concrete flooring provides a solid support for machines which require solid, level surfaces to operate. Adding a new foundation directly below equipment saves time and money, as your entire facility floor won’t need to be replaced. We keep the construction area as contained as possible to avoid disrupting your workflow. Machine base foundations are set with rebar for additional reinforcement. The rebar beams are arranged to better distribute weight from your industrial equipment. We work with structural engineers to calculate just how much support your floors will need based on the machinery you use. Get a sturdy floor with our reinforced concrete. 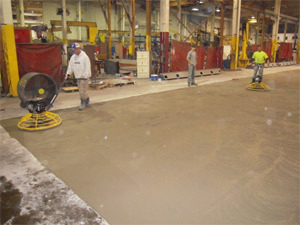 View our commercial concrete gallery showing our past concrete installation work at industrial Wisconsin facilities. Don’t settle for regular concrete. Contact Dornbrook Construction for industrial concrete flooring.